Contrary to popular belief, not all of us writers are alcoholics. But many of us do enjoy a tipple now and again – and if it has something to do with literature, all the better. This cool little drink-making typewriter from DIY master and artist Morskoiboy may not be related to “literature” in the strictest sense of the term, but there is at least a typewriter involved. 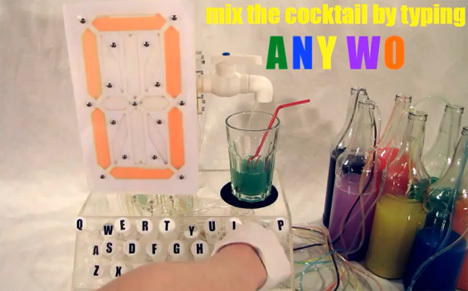 Typing any word on the keys will result in a unique and wholly unusual drink related to the letters in the word or words. Each key is a pump which dispenses a different type of alcohol into a waiting glass. Each letter is associated with a specific color, name or taste: A = Apple, K = Kahlua, G = Green and so on. As the keys are pressed and the syrups are dispensed, a completely personalized cocktail begins to take shape. The colored syrups pass through the large LCD display, providing a dazzling show to watch while your customized drink is being made.